Methods: Between December 2010 and March 2011, 50 patients requiring cholecystectomy for benign gallbladder disease were enrolled in this study. Twenty-five patients (Group 1) had undergone laparoscopic cholecystectomy (LC), while the other 25 were operated on with saline irrigation (30 ml/kg) under the diaphragm (Group 2). The obtained plasma level of BE was measured at the beginning and end of the operation. The degree of STP following LC was assessed using a visual analogue pain scale (VAS) at 6, 12, and 24 postoperative hours. Results: Eight patients in group 1 (32.0%) and seven patients in group 2 (28.0%) complained of STP. There was no significant difference in operation time, postoperative hospital length, postoperative BE, dose of analgesics or VAS at 6, 12 and 24 h after surgery between the two groups. The intensity of abdominal pain (AP) was significantly higher than for STP. Postoperatively, significantly elevated levels (11.3 5.1 pg/ml) of BE were observed when compared to preoperative levels (9.7 5.2 pg/ml) of BE (P = 0.02). 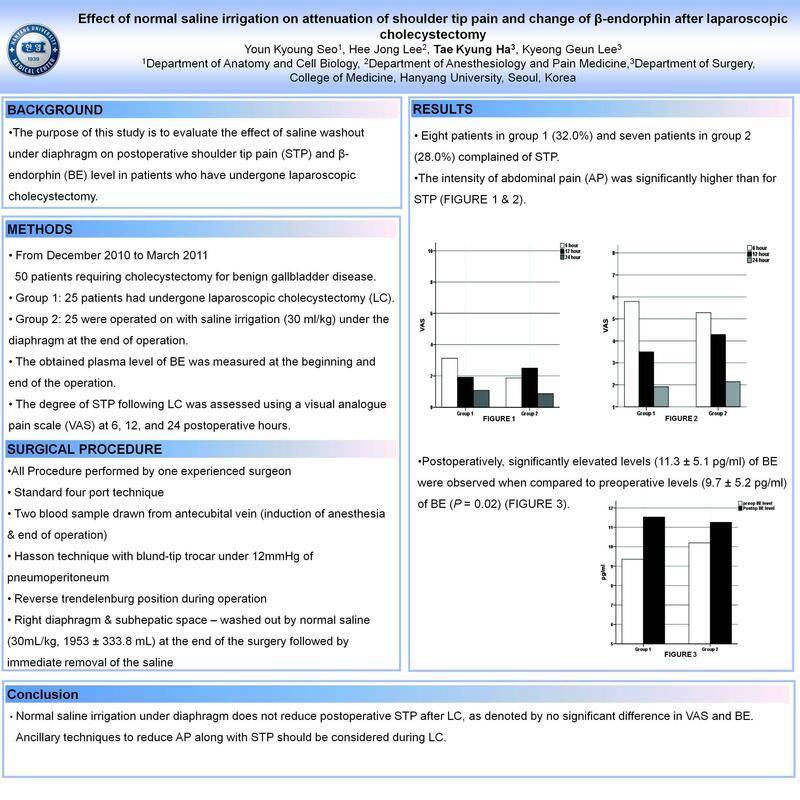 Conclusion: Normal saline irrigation under diaphragm does not reduce postoperative STP after LC, as denoted by no significant difference in VAS and BE. Ancillary techniques to reduce AP along with STP should be considered during LC.